Link: “Unified Brain Field … Gender Roles,” by Alice B. Clagett, Filmed on 2 June 2015; published on 4 June 2015; transcribed and revised on 1 November 2018; https://wp.me/p2Rkym-6OK .. This entry was posted in ZZ- Awakening with Planet Earth and tagged astral octopoid artificial intelligences, Christ, mastery of mind, notice, SPEs, unified brain, Yogi Bhajan on 1 November 2018 by Alice B. Clagett. Here is the beautiful painting “Escape by Night” by Rose Datoc Dall: https://iamofthestars.files.wordpress.com/2018/05/85ae7-escapebynightframedcompositewatermark.jpg .. This entry was posted in Bible and tagged baby Jesus, Bible, Christ, Christianity, Escape by Night, Mother Mary, Rose Datoc Dall, Saint Joseph, story of Christ on 9 May 2018 by Alice B. Clagett. Christ was a married man; a happily married man. He had a beautiful, young daughter about 6 years of age. And he and his wife … when things became very difficult where he was … escaped by boat to the Italian shore; to the shores of Italy. And there they lived a long and happy life. During that time, his wife bore him seven sons, in addition to the daughter that had been born. And they died, in a goodly length of time … at the right time … in a ripe, old age, having uplifted and taught many, many people, and inspired many people during their lifetime. That’s an interesting variant story of the life of Christ, is it not? I can’t help but wonder, if many people thought that to be the life of Christ, how things might change in the Christian world. How, for instance, the notion that persecution always exists in the world, might be dampened and subdued. And how the notion of retributory vengeance and persecution would also fade … fade from the fabric of our reality. Would that not be wonderful? Even for those who believe as things are right now … who believe that Christ was crucified, and that it was necessary that he be so, in this dimension, it is possible to live that life, by concentrating on His earlier life and teachings, which are very uplifting and sustaining, are they not? And not dwelling, so much, on the pain and suffering of his final moments, but instead on the wonders of his life on Earth … the wonderful things that he did for humankind. Link: “Yoga Sutras 1.5-1.11: Un-Coloring Your Thoughts,” from the “Yoga Sutras of Patanjali,” by Swami Jnaneshvara, http://swamij.com/yoga-sutras-10511.htm .. This entry was posted in Advaita - nonduality - duality, Christianity, Forgiveness - judgment - vengeance - hatred, Patanjali - Swamij, Soul wounding - soul clearing - core star energy, Unity - oneness - harmony and tagged advaita, Christ, Christianity, decoloring technique, harmony, Patanjali, Peace, persecution, soul wounding, Swami Jnaneshvara, Swamij, uncoloring thoughts, vengeance on 30 January 2018 by Alice B. Clagett. 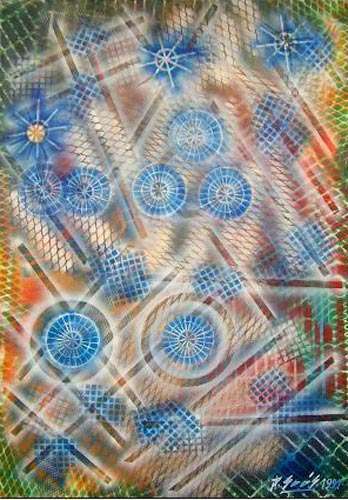 Image: “Seraphim,” by Joska Soos, 1991, http://www.soul-guidance.com/houseofthesun/media/jsimages/ent07.jpg .. This entry was posted in Angelic realm, Christianity, Prayers - blessings - mantras - affirmations - white magic, Prayers by Alice and tagged Angelic realm, angels, archangels, Cherubim, Chris Zabriskie, Christ, Christianity, Dirk Gillabel, Dominions, House of the Sun, Potentates, Powers, prayers, Prayers by Alice, Principalities, Seraphim, Thrones, Virtues on 21 December 2017 by Alice B. Clagett.